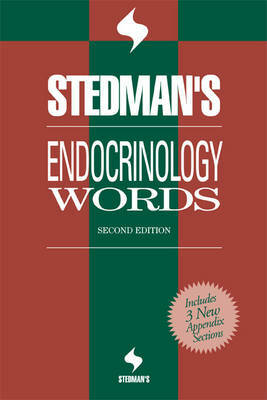 "Stedman's Endocrinology Words, Second Edition, on CD-ROM" provides added functionality for quick, easy access to all the features in the print edition, including terminology related to the thyroid, diabetes, hormones, protocols, diagnostic and therapeutic procedures, new techniques, and lab tests. The expanded appendix section includes anatomical illustrations, normal lab values, endocrine glands and associated products, classification of diabetes, wound care products, sample reports and dictation, common terms by procedure, and drugs by indication. Users can conveniently access the CD-ROM version from their tool bar to use features such as Wildcard Search, Search by Appendices, Copy, Paste, and Print. It is Windows compatible.